As I step into the Victoria and Albert Museum, I can’t help but take note of the beautiful historic architecture, chandeliers and ornate sculpture lining its entrance – a loving reminder of the building and institution’s historic origins. Suddenly, my reverie is cut short and I am stopped in my tracks by a 10ft Aladdin Sane album banner, proclaiming “David Bowie is… Watching You”, teenage tourists running past me with lightning bolts painted on their faces and a crowd waiting eagerly for coveted day tickets – this is feeling more like the build-up to a rock concert than a typical exhibition! When I get to the entrance of the exhibition, it all becomes clear. This is no typical exhibition, it is a rock concert. It’s a rock concert, a film viewing, a fashion show, an historical insight – an open book into Bowie’s life, loves and influences. Curated by Victoria Broackes and Geoffrey Marsh, the show cleverly weaves together what I would call the Bowie process: his influences, the resulting work, and how that work has gone on to influence others, whether that be through popular culture, fashion or music. At first chronological, the show starts at the literal beginning, with photographs of David Jones as a baby (he would re-Christen himself Bowie later), through to his first years in art school and his first band, the Konrads. However, that’s where the linear time theme seems to end, as the narrative begins to dart in several directions – much, I would think, like Bowie himself. The thing that stuck with me most was that, once again, the V&A have triumphed in integrating cutting-edge digital media into their temporary exhibitions. This first occurred to me with Hollywood Costume, this exhibition’s predecessor, but with David Bowie is the custom-made audio tour helped bring the whole show to life. 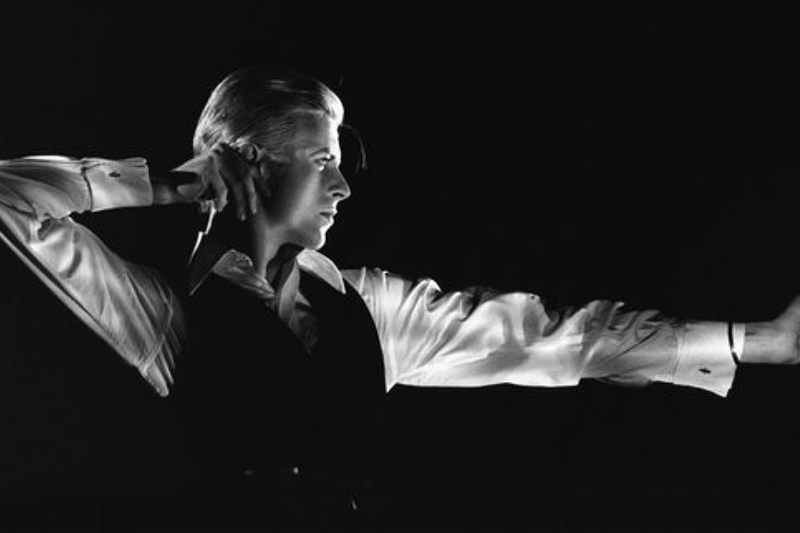 You see the process from start to finish: Bowie’s influences, his hand-written lyrics, the specially made costumes, and finally, hear the music as an overture to the whole experience. Given his ubiquitous nature of late, it’s reassuring to know there are still things to learn about Bowie; I was impressed with his flair and eye for fashion, being able to see over 20 of his original costumes up close. 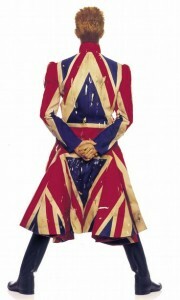 His ripped union jack tailcoat – designed by a young Alexander McQueen – stuck out for me, hearing how Bowie plucked him from art school to design the jacket – always ahead of the curve. The beautiful hand-made costumes by Kansai Yamamoto where also a star feature, accompanied by an interview with Yamamoto himself, who summarised that his collaboration with Bowie was “simply meant to be”. David Bowie is offers us a rare glimpse into the personal world of a very private man. Although curated and shown in a public institution, many of the objects in the exhibition come from Bowie’s personal archives, and resonate with a sense of hidden meaning – we have been granted access and seen them, but will never really know about them fully. Much like the Verbasizer (a machine built specifically to help Bowie create lyrics from jumbled words) from the show, the exhibition leaves you feeling you have been allowed special insight into a hitherto difficult to reach star, but like lifting a rock only to take a quick glance at what’s underneath, the discoveries stop short of revelations. And that’s how I think Mr. Jones would like to keep it.